The time has come to start harvesting your root vegetables. 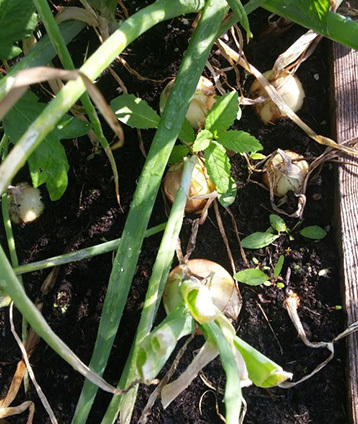 Onions are ready when the greens onions stems start to turn brown (top left picture). It is time to pull them out. You can leave them out in the sun to cure for a couple week or eat them right away. For beets and carrots, the best way to check it to stick your finger in the soil and investigate, if you like the size harvest and enjoy. Make sure to harvest, harvest, harvest! You should have beans, cucumbers, zucchini, root veg, some last peas and even the first cherry tomatoes, peppers and eggplants! Consult our harvest section to learn more about harvesting various crops. The peas shoots are starting to turn brown. These peas should be pulled out of the garden and any last nice looking peas harvesting. Just pull the whole vine out, don’t be afraid! This will make more space for your tomato plants. Make sure to make space for every plant! Cut back tomato vines that can’t fit on the trellis, cut large leaves kale, chard, or any other leaves that are shading out their neighbours. We’ve started seeing powdery mildew in the garden. It’s important to cut out affected leaves and dispose right away – it spreads very quickly! Spray plant every other day with a baking soda solution to stop the spread. Click here for more details. 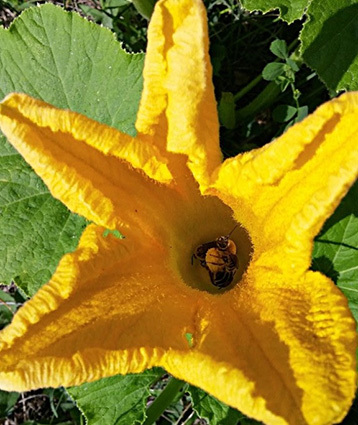 If you have cucumbers or squash in your garden, the flowers are starting. The bees at the greenhouse love these flowers they are very busy these days! It is important to have insect activity in the garden so that your plants get pollinated. f your plant blooms and does not produce fruits you may not have enough insect activity and need to pollinate your cucumbers by hand using a soft paint brush. Move pollen from male to female flowers with the tip of your paintbrush. The aphids have been spotted in the gardens. Aphids come in many colours including black. They can be sprayed off with a strong jet, squished with your fingers. If you have a bigger infestation and you cut of the most affected part of the plant and remove the rest with a strong jet. The hot weather is not over, so remember to keep watering!